January 19, 2018 – The Exploration Mission-1 artwork showcases the Space Launch System (SLS) rocket carrying the Orion spacecraft and lifting off from Launch Pad 39B at NASA’s Kennedy Space Center in Cape Canaveral, Florida. The triangular shape represents the three main programs that comprise NASA’s Deep Space Exploration Systems: Orion, SLS, and Exploration Ground Systems, and is a classic shape for NASA mission emblems dating back to the shuttle era. Several elements within the design carry symbolic meaning for this historic flight. The silver highlight surrounding this patch gives nod to the silver Orion spacecraft, including the European service module that will be voyaging 40,000 miles past the Moon in deep space. The orange rocket and flames represent the firepower of SLS. The setting is historic Launch Pad 39B, represented by the three lightning towers. The red and blue mission trajectories encompassing the white full Moon proudly emphasizes the hard work, tradition, and dedication of this American led-mission while also embracing NASA’s international partnership with ESA (European Space Agency) as both agencies forge a new future in space. 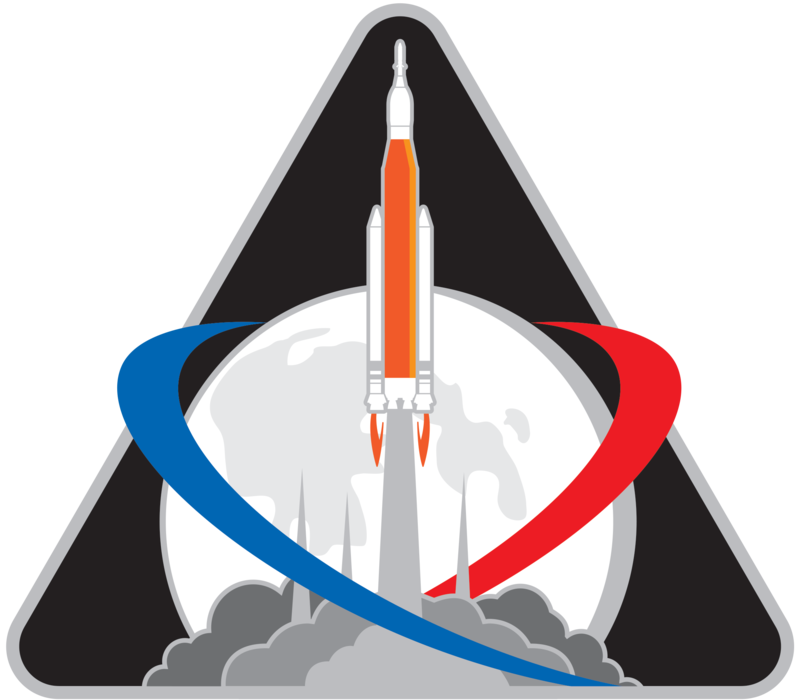 The Exploration Mission-1 emblem was designed in collaboration by the creative team working for the Deep Space Exploration Systems programs, which includes Orion, SLS, and Exploration Ground Systems, located at NASA Headquarters in Washington, Glenn Research Center in Cleveland, Johnson Space Center in Houston, Marshall Space Flight Center in Huntsville, Alabama, and Kennedy. Because the maiden mission of SLS and Orion is uncrewed, the program teams had the rare opportunity to conceive the mission identifier. Exploration Mission-2, which will fly with crew, will have an insignia designed by NASA’s Astronaut Office with the help of the crew that will fly aboard the most capable deep space system to take flight. During EM-1, Orion will launch atop the agency’s Space Launch System rocket for an uncrewed mission traveling 40,000 miles beyond the Moon and returning to Earth with a Pacific Ocean splashdown. The mission will demonstrate the integrated system performance of the rocket, Orion spacecraft and ground support teams prior to the first flight with astronauts on board.